An international group of 44 people, from among more than 80 anti-mining protesters, including, Frenchmen, Chileans and Argentineans, were arrested by Chilean authorities recently while protesting the highly controversial mega mining project known as Pasqua Lama. The protesters were taking part in a "peaceful" blockade or sit-in, meant to impede entrance to the site for trucks operating there for Toronto-based Barrick Gold, which after several mergers and consolidations has become a giant in the industry. The Pasqua Lama project is Barrick's answer to "responsible mining." The protesters were detained by local authorities. They are awaiting court hearings and charges to be laid against them. The proposed mining site, high above in the Andes, is situated along the Chile-Argentina border. Reports from the region issued by O.L.C.A. 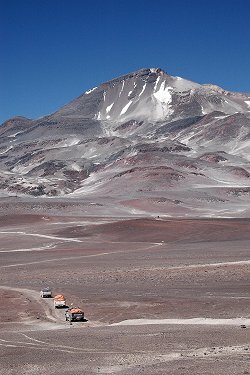 (Latin American Observatory of Environmental Conflicts), a Chilean nongovernmental organization, state that the protesters blocked roads leading to the site. Their apparent objective was to impede heavy machinery and trucks from gaining access to the remote area known as the Huasco Valley. Apparently, massive deposits of high-grade gold, silver and copper are embedded deep within the mountain chain, at altitudes of over 4,500 meters. Since the site is at such a tremendous height, logistically it would involve perhaps helicopters and aircraft, which are capable of carrying huge payloads to and from this remote "no man's land" to get at the gold. Reaching the site with heavy lifting machinery and wide girth trucks is practically impossible. In addition, gaining access to the mineral rock deposits buried inside the mountain's inner core would involve literally removing or blasting (by means of explosives) parts of the mountaintop, seriously and permanently altering the geography and topography of the Andes. Environmentalists opposed to the project also argue that 300,000 to 800,000 cubic meters of ice will have to be removed from the mountain peak as part of the extracting process. They along with farmers are also concerned about the possibility of highly toxic cyanide residue running downstream from the mountaintop; thus potentially poisoning the rivers and water supplies downstream from the site. As it is located on the border of two states, Pasqua Lama is unique in the annals of mining history. Whether one agrees with the project or not, it is an extraordinary engineering endeavor, in addition to being an oddity of jurisprudence: a binational treaty negotiated at the behest of foreign mining industry lobbyists and with outside diplomatic assistance has effectively "legalized" and ceded territorial sovereignty of a vast area of the Andes to a foreign private entity; thus, permitting mineral extraction on both sides of the border area. An exploit that would surely, just by its brazenness, make the colonial iconic mining magnate and philanthropist of his day Cecil Rhodes proud. One of the beneficiaries of this treaty is Barrick. The company it seems has a very dodgy history when it comes to mining operations worldwide. It has been accused by international and local N.G.O. 's and human rights groups of willfully burying several individual miners in Tanzania. These allegations, however, remain unproven. Responsible Mining or Simply Wanton Plunder? Overall, Barrick is just one of many. Canadian mining companies are some of the most active in Latin America. An impressive 60 percent of all mining companies worldwide are Canadian-based, with their stock listings on the Toronto, Vancouver, and New York exchanges. Mining is without doubt a key sector of the Canadian economy. It generates revenue of $40 billion annually, which represents 4 percent of the gross national product. Especially in Latin America, a virtual mining bonanza is now underway due in part to the rising price of commodities such as gold but also because the area has very lax environmental laws compared to the United States and Canada. Another factor is this: in trade liberalized countries such as Argentina and Chile, profits and earnings are high due to the very low tax rates imposed on mining operations in the region. Just because local authorities are unable or unwilling to apply much stricter environmental standards for the foreign-based miners to adhere to, N.G.O. 's such Mining Watch of Canada argue, does not mean that Canadian companies in the region have carte blanche to ignore labor codes and environmental standards in those countries. According to Jamie Keen of Mining Watch, the Ottawa-based N.G.O. that monitors mining activities worldwide, in the last decade Canada became "the world's largest investor in Latin American mining. Canadian mining companies are responsible for environmental degradation and human rights abuses throughout the region." Keen, along with his N.G.O. colleagues in Latin America, have called on Canadian Prime Minster Stephen Harper to impose strict and verifiable rules or a corporate "code of conduct" on Canadian mining companies investing in mineral exploration and mining abroad. Is the Canadian government listening to these pleas for reasonable mining practices? That remains to be seen. In the meantime, the gold rush in the Andes continues. View the Worldpress Desk’s profile for Michael Werbowski.